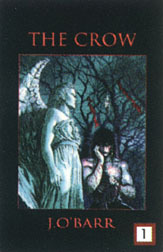 The Crow book, by James O'Barr. Includes the complete story of The Crow, unpublished art and an 8-page color gallery. B&W and color graphic novel. Original price $15.95.